While Santa was busy with his Christmas duties, there was a very strong snowstorm in his magic land. The storm was so strong that it reached into the deepest caves and spread crystals of magic ice from those caves over entire Lapland. Then huge amounts of colored ice started growing in most inappropriate places and interfering with the normal life of Lapland inhabitants. But Santa never gives up! GAL-apagos is an addictive Arkanoid-style game with fun and colorful graphics and polished gameplay! The setting of the game is in the sunny Galapagos where you resque beautiful girls that have been captured by the Idols of the Temple. 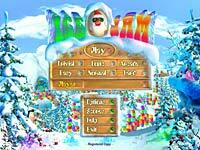 The game features 24 stunning levels that will challenge your dexterity and your brain too! There are 8 beautiful girls waiting for you and 13 different bonuses each with amazing effects! The concept is simple. The game is challenging. You collect all the jewels on the screen to proceed to the next level and try to do it in the shortest amount of time. To get to the jewels, you break the colored blocks. Avoid the exploding mines and falling rocks. Start your quest for lost treasures in this modern remake of well known classic game. You can play as one, and together. Action of game occurs in picturesque interiors of ancient castle, on a background of vaults and treasures filling them. In difference from a classic game you should cope not simply with falling figures filling a game field, but also to carry out certain missions gradually moving ahead. Want to try something new for a change? Kristanix Puzzle Collection offers three unique puzzle games for you to enjoy. The action puzzler “The Weight Balls”, a more relaxed experience in “Master Writer” and the strange “The Shepherd”. The games vary in control method (both mouse and keyboard are used) and in puzzle style (action puzzles, word puzzles, logic and a little math). Non-stop action space shooter with extremely simple controls suitable for all ages! Space shooting has never been so simple and addictive! With Clash'N Slash arcade game you will battle pesky aliens all around the galaxy. Loads of weapons, upgrades, enemies will hold you for a long time and innovative bonus triggering system will make your game experience colorful and fun. Advanced Pegs is a replica of a classical card play of the 17th century. Its author is unknown. There are two types of it - English and Continental-European. The play starts on a field filled with chips though with at least one spare square. The goal of the play is to remove as many chips as possible. The chips come in two shapes: regular apples and monster apples, which eat the first ones. Vivid graphics and animated agents shall be a catch! Meet beautiful Betty. She works in an awful bar, far away from any major city, where the most wacky and fun characters go for some beers. But her dream is to own a bar in a tropical beach. Help her raise the needed money working in several different bars so she can fulfill her dreams! Betty's Beer Bar is a fast paced and addictive game. Your task is to serve the customers as quickly as possible - keep them happy and they will give you huge tip! renesia is a fun and addictive retro arcade Shoot em Up game that will shake you up, twirl you around, turn you upside down and drop you on your head. And you'll like that! Slalom with your ship, collect bonuses, shoot aliens, dance around your room (or whatever it is you do) and send your adrenaline levels to the sky with this intense game that will workout your dexterity. Hey, but don't blame me for your addiction. Ready? You're on your own. Rings&Colors is a new Twist on famous Rubik's Cube game! 12 balls of different colors are located on three intersecting circles. A player can rotate any circle with balls clockwise or counterclockwise. The objective is to make a desired figure out of colored balls. Try your hand in Rings&Colors and beat your best score! A young elephant, Joy by name, from the tribe called Flying Elephants is to discover the mystery of the lost star and to bring back the kind magic together with the stars shine.The cartoon arcade about the flying elephant Joy and his adventures is a mixture of a beautiful fairy-tale and a funny action. The enchanting landscapes of the Jungle, Forest and Moonlit Path is the place for a thrilling struggle between the elephant and his evil enemies. Eddie is a passionate electrician in troubles. 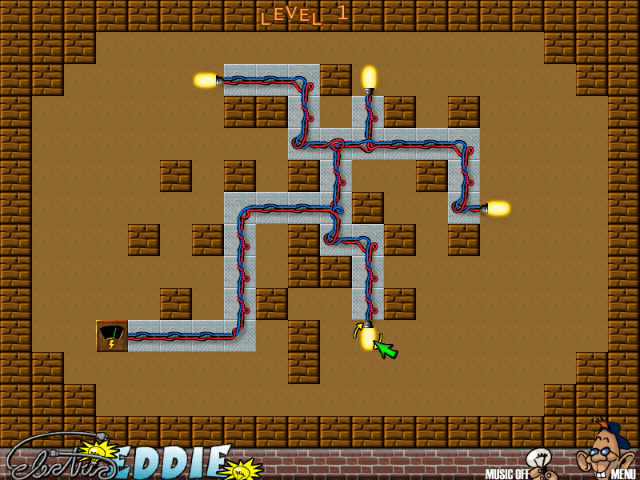 Help him to wire the tricky cablesfrom batteries to bulbs in this new and extremely addictive puzzle game with tensof funny levels! Rules are easy - plug in, switch on, shine on - but puzzles will blowyour mind. Once you get connected, you won't want to stop!You find yourself in the position of Electric Eddie - equipped with pack of switches,pliers, bulbs - trying to find a way through the labyrinth.